The Texas Conference met in annual session in Columbus in late October, 1863. The Civil War had disrupted episcopal visitation schedules so for the second year no bishop presided over the annual conference. Robert Alexander presided instead. The war had created problems in filling all the appointments. Five members were missionaries to the Confederate Army, four had enlisted as chaplains in the army, and six preachers, including last week’s subject, W. G. Veal, had enlisted in various combat roles. One highlight of the conference was the appearance of General John Bankhead Magruder, Commander of the Confederate District of Texas, New Mexico, and Arizona. Magruder was a Virginian who had graduated from West Point. He had preformed ably at Yorktown, Va, against General McClellan, but not so well at the Seven Days Battles. He was reassigned to Texas, a distant theater, and made his home at Houston. His most famous military action was driving the federal forces out of Galveston (temporarily). His address to the Conference included authorization to ship cotton to Mexico to avoid the federal blockade. The cotton was to loaded on ships flying British flags and sold to pay for the Texas Christian Advocate. Your editor has not been able to learn whether the authorization resulted in revenues for the denominational newspaper. Dallas, Texas, Oct. 25.—Dr. H. Jones, a prominent physician, to-day shot and killed W. G. Vial at Ex-Confederate Headquarters2. This is Confederate Day of the Texas Fair. A great crowd, including Gens. Reagan, Ross, Harriet, and Mrs. Hayes, daughter of Jefferson Davis, were present. Capt. Vial was in a room at the Confederate Headquarters2 writing at a table at 9:30 o’clock, when Dr. Jones appeared and without a word of warning shot Vial in the right temple, killing him instantly. Vial’s head fell over on the table, and so presented a sad sight to his fellow-ex-Confederates. Jones was arrested and placed in jail. Two years ago Vial was a prominent Methodist preacher at Waxahutchie (sic), and was afterwards expelled from the Church and ministry and also from the Masonic order for immoral conduct and efforts to seduce a young woman he had just baptized. Since then he had been a real estate and railroad boomer at Fort Worth and Dallas. Jones is an Alabamian. He said he killed Vial because of his wife. It is reported that Jones this morning charged Vial with having seduced his wife some time ago. Jones was tried, found guilty and sentenced to prison. He appealed successfully and died awaiting a new trial. 1Veal’s name is spelled incorrectly every time it is used. 2At the corner of Commerce and Lamar. The end of an era occurred with the death of Homer Thrall on October 12, 1894. Thrall had been one of the missionary recruits from the Ohio Valley who arrived in the Republic of Texas in 1842. Littleton Fowler had gone north to recruit missionaries who were needed for the expanding Texas population. Homer Thrall, a member of the Ohio Conference, was so eager to get to Texas that he left before the rest of the travelling party and arrived in Galveston in November, 1842. He received his first appointment at the annual conference that was held at Bastrop and thus began one of the longest and most distinguished ministerial careers in Texas Methodism. Two of the missionary recruits of 1842, William O’Conner and Daniel Poe, died soon after their arrival in Texas, but another two, Homer Thrall and John Wesley Devilbiss (died 1885) lived long, productive lives and became two of the most important figures in 19th century Texas Methodism. Previous columns have lifted up the importance of the MECS General Conference of 1866. Delegates to the Conference, held at New Orleans, convened with a full agenda. The General Conference of 1862 had been cancelled. The bishops were eight years older and more infirm. African American Methodists were leaving the MECS wholesale. Most institutions had not survived the Civil War. Revenues for missions, salaries, publishing, etc. were next to nothing. In spite of these problems, the General Conference found time to authorize the Texas and East Texas Conferences to divide so as to form new annual conferences. So it was, that the East Texas Conference, meeting in Marshall, assembled on October 10, 1866. The General Conference authorized, but did not mandate, the division of the East Texas Conference. Eventually the conference did vote to divide so as to create a new conference. That conference was first named the Trinity Conference. After one quadrennium it became the North Texas Conference. 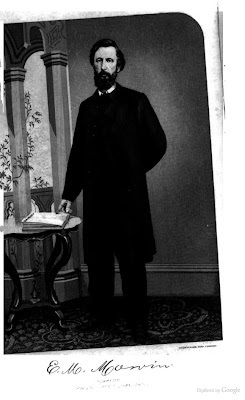 Enoch Marvin was the presiding bishop at the 1866 annual conference. Marvin was a Missourian who had come to Marshall during the Civil War and was appointed to Marshall Station. He had been elected at New Orleans while still en route the previous April. After his election, he returned to the Marshall pulpit and served until the first of August. He then established residence in St. Louis and began his first round of annual conferences. His first conference was the Indian Mission Conference. He then came back to Marshall—the city that had been his home for five years, to the church he had served to hold his second annual conference. The North Texas Conference thrived. North Texas boomed at it was connected to the rest of the United States by rail. The conference quickly established itself as one of the largest in the MECS. The East Texas Conference did not prosper. In 1902 it rejoined the Texas Conference from which it had been split in 1844.